Roars like a Lion when she's full throttle, and purrs like a kitten when she's idle?
. . . A Fur-RAWR-i, of course! Libby was the "Patriot" puppy from our Ted X Clover litter. Every time I'd turn around, this dynamo with the red, white, and blue collar would be staring at me with an impish grin. It soon became evident that this little lady REALLY liked to work, and I knew she was going to need a very special working home. My training buddies kept telling me that this was my next obedience dog . . . But I was not planning on keeping a girl! One day, after I'd extracted my pant leg from her mouth for the umpteenth time, she glared at me with an intensity I couldn't deny. The look on her face was clear, "You know you want me!" I caved. One day when the pups were 5 weeks old, I was standing at the sink washing dishes, and I suddenly felt like I was being watched. I turned around to see my Patriot pup burning holes in me with her eyes. As soon as she knew I'd seen her, she quickly spun a circle. I turned my back on her again, reached for my clicker, then turned back to her. Again, she whipped herself around. This time I clicked the behavior, gave her a snack, and in less than a week, we had this! Even though Libby has points toward her AKC Championship, we don't spend that much time in the Breed Ring together. We have the most fun in the working venues! 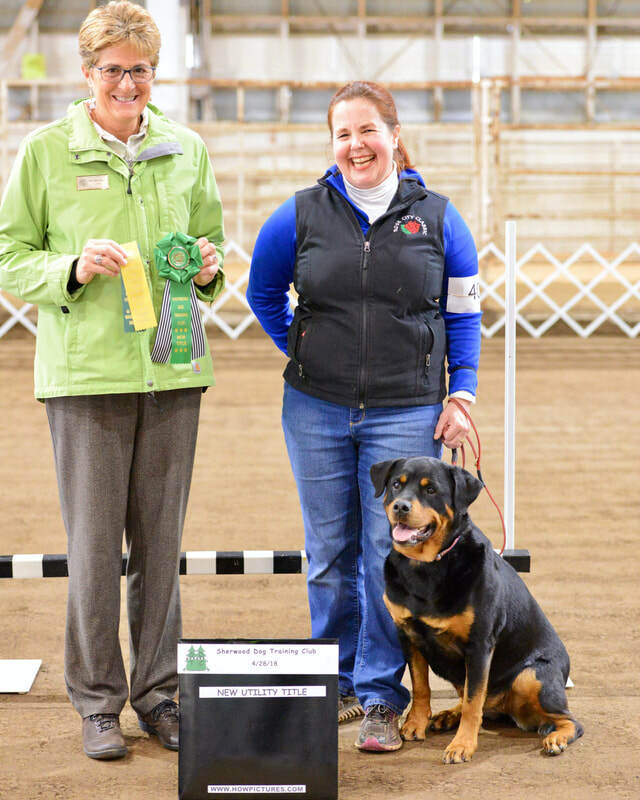 ​Libby finishes her UD at the 2018 Sherwood Dog Training Club Spring Obedience and Rally Trials! Libby Finishes 2016 in the ARC's top five Carting Started dogs. We never really had to "break" her to the cart. ​We just hooked her up and off she went. 'Til her daddy takes the T-Bird Away!